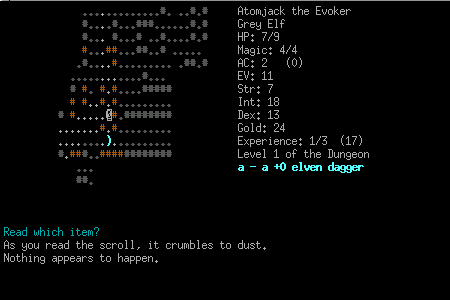 Here's a short journey showing the life and (eventual) death of one of my many, many Crawl characters. 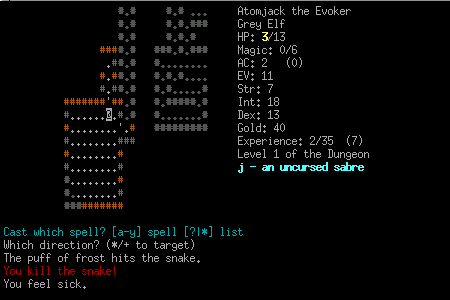 Atomjack (the four hundred and seventeenth, but that's another story) started out life as a simple Level 1 Gray Elf Conjurer. He knew one spell, Magic Dart, and as you can see from the screen had only four pp. 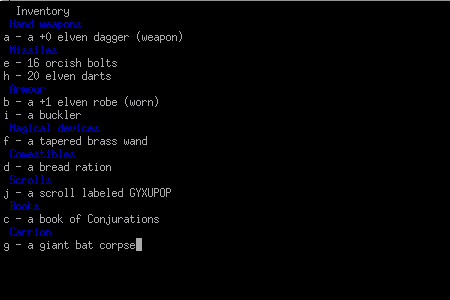 Any pure spellcaster is going to be useless at fighting in the early game, so that means that Atomjack has four Magic Darts, then he's toast. Keep that in mind. 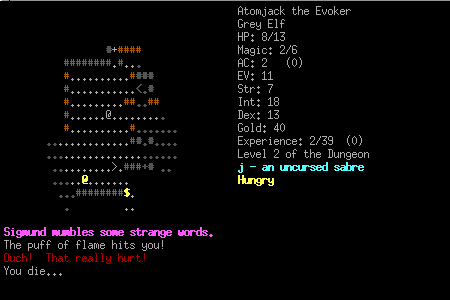 Atomjack went a-wandering, and quickly came across a scroll. 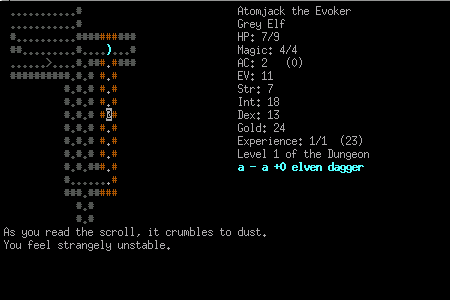 If you find a scroll in the early game, it's almost certainly worth reading it to find out what it does. 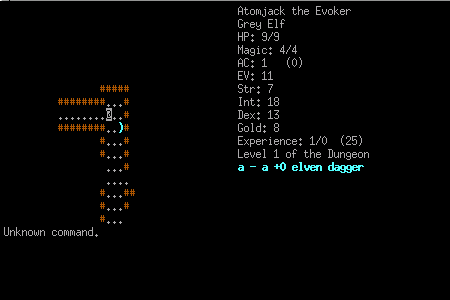 In this case, luck was on Atomjack's side and his cloak glowed green (a scroll of Enchant Armour, giving an AC of 2!). 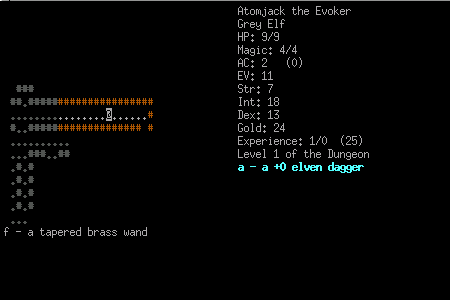 A bit more wandering led him to a wand. Never try wands on yourself first! It's also not a good idea to try a wand on a beastie which might kill you, except as a desperate measure. Save it until you're faced with a nice safe rat, and then zap it and see what happens. In this case, the first beastie Atomjack came across was a bat, and in the excitement of the moment he completely forgot about the wand and slayed it with a Magic Dart. Whoo-hoo! He picked up the corpse and soldiered on. Again, it's worth reading scrolls as you find them in the early game. Oops: it's a teleport scroll! 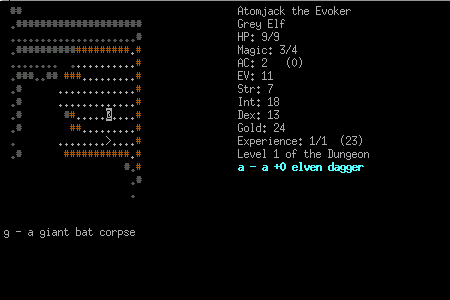 Atomjack converted the hobgoblin corpse into nice meaty Hobgoblin Chunks(TM) (the 'D' command) and stuffed them in his pack. You never know when you might get hungry enough to eat raw hobgoblin! Note that Atomjack had been hit during the battle, and was down to a mere 6 hp and 1 mp. 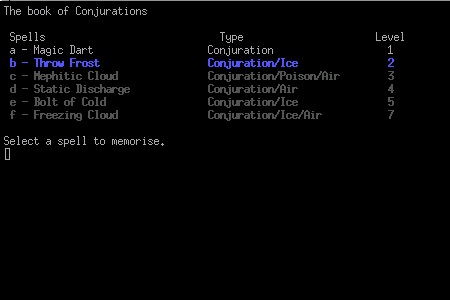 Going wandering around the dungeon in this state is asking for a beating: remember, when mp=0, hp=0 soon after for a spellcaster. Atomjack stayed where he was and rested until he was back up to par. HP aren't so critical, so long as you've got at least 6 or 7, but spellcasters should usually rest until they've got most or all of their mp back after combat. This could be something useful, like a scroll of recharging, or it could be completely useless. If Atomjack finds another of these scrolls, he's going to keep it until he can identify it (or work out what it is by other means). 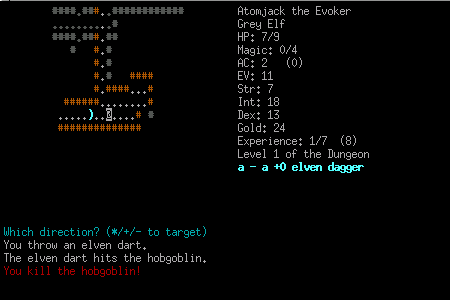 Heading south, Atomjack kills a hobgoblin with ease, but then stupidly keeps going and another hobgoblin sees him! He casts a Magic Dart at it with his last pp, but it's only wounded. Now he's in trouble! If that dart hadn't hit, Atomjack would have run away. Nearly all monsters are as fast as you are, so you won't actually get away from them. What you are aiming to do is to prevent being hit while waiting for a magic point or two to regenerate. 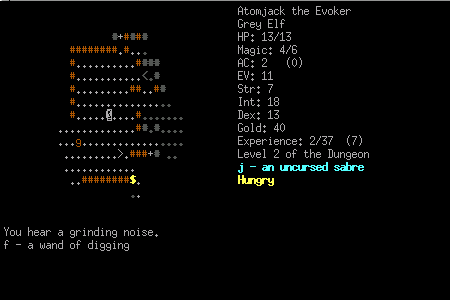 The ideal tactic is to play the pillar game: find a small loop nearby, preferably in an area you've already cleaned out. 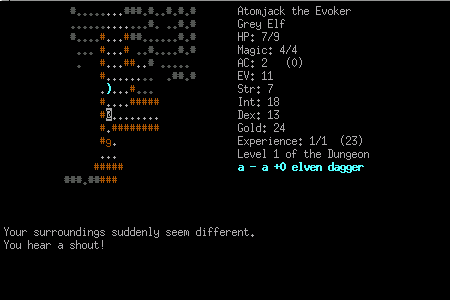 Run round and round and round until you have regenerated (a) at least one mp, and (b) have enough hp that you are sure you can survive being hit once. Cast your spell, rinse and repeat. 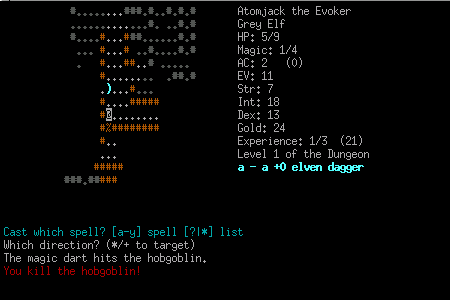 This really is a bit of a desperation tactic, but you have a much better chance of survival than if you try to go toe-to-toe with a hobgoblin. Note that if the critter is faster than you are (eg snakes) then don't even attempt this tactic: you'll get creamed. Atomjack now waits to recover his hp and mp, and notices that his Stealth increases while doing so. 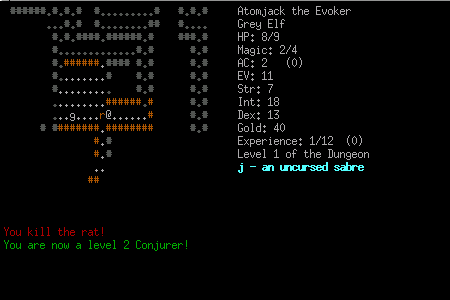 At this point in the game, spell skills are probably more important than Stealth to a spellcaster, so Atomjack turns off Dodging and Stealth for the time being. 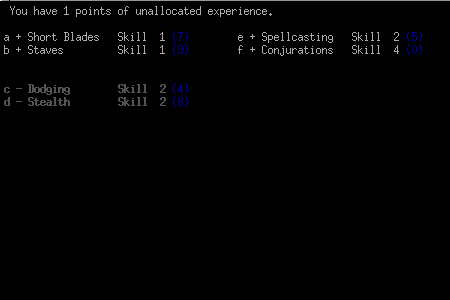 This is a compromise: both of these skills can actually be very useful, but I prefer to try and get my spell repertoire and damage up as soon as possible. 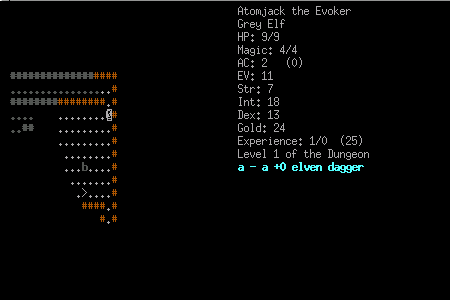 A bit more monster-thumping, and it's level-up time! Note that Atomjack has wielded the sabre he found earlier. This was a calculated risk: in general it's a bad idea to wield unidentified weapons. However, as a level 1 character it may be worth the risk if you're prepared to lost the character and start again if the weapon is cursed. This is no 'small snake' but a real honest-to-God Snake with a big S. This beastie is seriously out of depth, and represents an immediate and deadly threat. Strike one: a Throw Frost! Unfortunately, this misses, but so does the Snake. 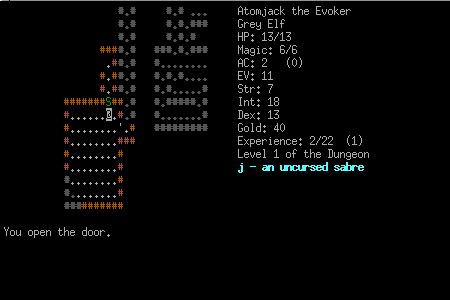 If Atomjack had an escape means (eg a scroll of teleport), this would be the time to use it: always escape before you are badly injured if you can. He can't. There's no point running, as snakes are fast. Only 4mp left now: Atomjack goes for the guaranteed damage of a Magic Dart as he can't afford another miss. The Dart wounds the Snake, but in return it gives him a nasty bite taking him down to 4hp and poisoning him. All or nothing: Throw Frost again. This hits, and kills the snake! Yeehah! Well, it's not healing, but berserking will do. 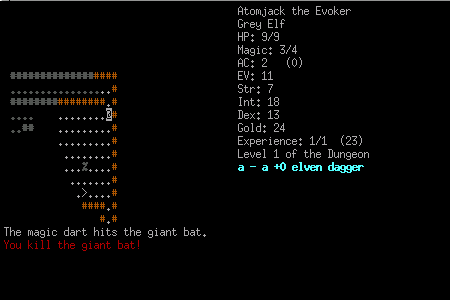 By the time the berserking wears off, Atomjack has 2hp left but is healthy again. He rests for quite a while to heal up. While resting, he starts to feel hungry so snacks on a lump of bat he had lying around from earlier. Atomjack finishes exploring the level, and finds nothing else interesting. Always try to explore a level in its entirety before you go down, and if it looks like there are bits of the level which are inaccessible, go downstairs and try to find stairs back up to the bits you have missed. Never go down to a new level if you still have anywhere to explore on the levels above. Atomjack saunters downstairs. He's hungry, but doesn't eat any of the food that he has in his backpack. 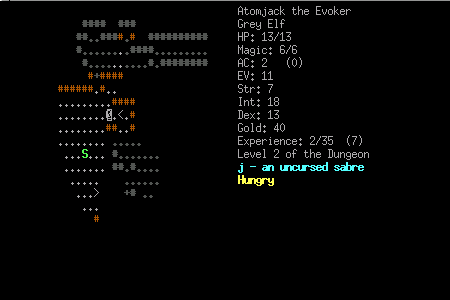 When you turn hungry, it's usually worthwhile wandering around for a while as more often than not you'll be able to kill and eat an edible monster and hence save one of your food rations. 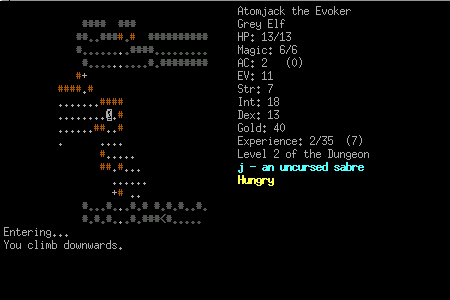 Don't leave it too long as a spellcaster, however, as if you get weak from hunger you won't be able to cast spells, and you really don't want to be eating during combat. More melee-oriented characters should NEVER eat a food ration or other food item unless they are starving. If you stick to this, you'll almost never lose a character due to starvation. Atomjack moves into the level: ANOTHER snake!! So much for that. Atomjack finishes off the hobgoblin and goes back to his dead snake. ...but not fast enough. RIP Atomjack.